We are looking for a Director , visit our Career Opportunity at the Museum page for more information. 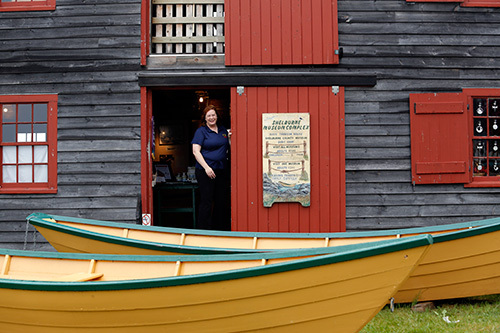 Step inside the Dory Shop Museum to witness, first-hand, the art of crafting a traditional dory and hear the story of these iconic Nova Scotian small-crafts. Built by John Williams in 1880, this dory shop was one of seven booming businesses in Shelburne that produced thousands of dories for both Canadian and American fishing schooners during the years of the famous Grand Banks fishery (1880 - 1971). In the middle of the last century, two innovative ideas revolutionized the way people fished: trawl fishing and dory fishing. Initially, crews would fish the banks from the decks of schooners, using baited hooks and handlines to collect their catch. Realizing they could improve upon this method, crews started hanging lots of hooks off one long line along the ocean floor, where hungry cod and haddock loved to feed. The idea worked and trawl fishing was born. Dory fishing came from the realization that crews could haul in even more fish if the men could spread out to cover more ocean. By piling a bunch of little boats onto the schooner and then carrying them out to the banks, crews were able to split up and maximize their efforts. When combined, the two new methods created a fishing technology that dominated the banks fishery until the 1940s. Dories were perfect for this new practice. Flat bottomed with flared sides, they could be easily nested and lashed in place on the decks of schooners. Until the mid-1880s, they were built using naturally curved wood, or "grown knees," as frames. These knees had to be sawn from crooked wood such as tree roots; a requirement that wasn't always easy to fulfill. In 1887, a Shelburne boatbuilder, Isaac Crowell, started using something he called the patent "dory clip." This allowed builders to make dory knees by joining together two straight pieces of wood. The result was tough, durable dories that were cheaper to build than conventional ones. Crowell's ingenuity created a thriving industry in Shelburne. At the height of the banks fishery, seven Shelburne shops churned out thousands of dories each year. They sold their products to both Canadian and American schooner captains, who got used to stopping in Shelburne to buy dories on their way to the Grand Banks. The Shelburne dory-builders thanked Isaac Crowell and smiled all the way to their own banks.